Copper Riot 1662. (Ernst Lissner, 1938). 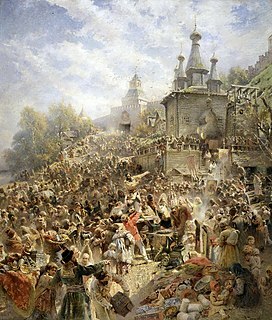 The Copper Coin Riot, also known as the Moscow Uprising of 1662 (Russian: Медный бунт, Московское восстание 1662 года) was a major riot in Moscow, which took place on 4 August [O.S. 25 July] 1662. The riot was preceded by a gradual deterioration of the Muscovite economy due to the Livonian War with Poland and Sweden and a sharp rise in taxes. In 1654, the Russian government decided to begin issuing copper money in large quantities, equating them with silver money. This government measure caused the devaluation of copper money leading to price inflation of top priority goods and mass production of counterfeit copper money with the involvement of some top officials. By 1662, Russia had already been experiencing an acute financial crisis. A few days before the riot, there had already been rumors about the so-called vorovskiye listki (воровские листки, or black lists), which contained the names of those responsible for economic misfortunes. These lists would suddenly appear posted in several neighborhoods of Moscow on the night of 25 July. They included the names of the "traitors", such as boyars Miloslavsky, okolnichys Fyodor Rtishchev and Bogdan Khitrovo, diak D.M. Bashmakov, merchants V.G. Shorin, S. Zadorin and others. All these people were accused of causing economic collapse after the introduction of copper money and having secret ties with Catholic Poland. The Copper Riot began on the early morning of 25 July and continued until afternoon. Up to 10,000 people took part in the civil unrest, mostly Muscovites (posad people, soldiers, reiters, some of the streltsy from the Moscow garrison, kholops, and peasants). After having read their proclamation, the insurgents made their way to Kolomenskoye to meet with tsar Alexei Mikhailovich. They demanded to surrender the "traitors" to the people and take steps towards stabilizing of the economy. The tsar and boyars promised to lower the taxes and conduct an investigation in accordance with the demands of the petition and proclamation, presented by the angry crowd. The insurgents took the tsar’s word for it and rushed back to Moscow, where, in the meanwhile, people were destroying the households of the most hated merchants. After meeting halfway between Moscow and Kolomenskoye, the two groups of insurgents went back to the tsar’s residence to stand their ground. By the time they reached Kolomenskoye, a large military force (6,000 to 10,000 soldiers) had already been assembled to counter the rebels. Alexei Mikhailovich ordered a merciless suppression of the unrest. As a result, up to 1,000 men were killed, hanged, or drowned in the Moscow River. Several thousand people were arrested and later exiled after a brutal investigation. Stepan Timofeyevich Razin, known as Stenka Razin (Стенька), was a Cossack leader who led a major uprising against the nobility and tsarist bureaucracy in southern Russia in 1670-1671. Plague Riot was a riot in Moscow in 1771 between September 15 and September 17, caused by an outbreak of bubonic plague.